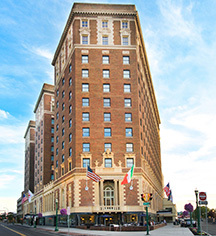 Featuring the finest accommodations in town, the restored historic Marriot Syracuse Downtown has 261 guestrooms, 13 of which are suites with separate living rooms. With advantageous amenities such as WiFi, flat-screen televisions with cable programming, a fitness center, business center, and on-site dining, visitors will find everything needed for a relaxing or productive stay. If a holiday party, special event, or wedding plans are in the future, the Marriott Syracuse Downtown offers over 41,000 square feet of versatile function space, suitable for all occasions and celebrations. The IACC approved Conference Center is located on the ground floor of the hotel, and with a professional on-site culinary team and event planners, the event planning experience is elevated to a new level. Marriott Syracuse Downtown is the official hotel of the Oncenter Convention Center, which is conveniently located steps away. 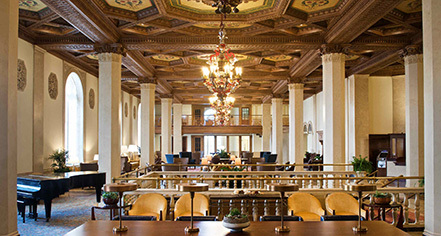 Marriott Syracuse Downtown, a member of Historic Hotels Worldwide since 2016, dates back to the 1924.